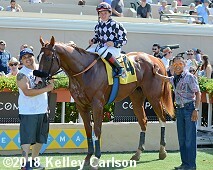 The feature race on Saturday at Del Mar's summer meeting was the $200,000 Yellow Ribbon Handicap (G2) for older fillies and mares going 1 1/16 miles over the Jimmy Durante turf course before 16,020 fans in attendance. Conditions were excellent at the seaside oval with sunny skies and temperatures in the low 80's. Last year's winner Cambodia was sent off as the 8-5 favorite in the field of 11 off a 7th place finish in the Just a Game (G1). 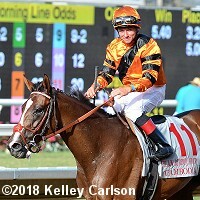 In to challenge her included 9-2 second choice Madame Stripes, 3rd in the Gamely (G1), and 5-1 third choice Hallie Belle, 3rd in the Modesty (G3) at Arlington. 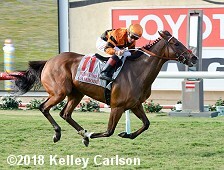 Jockey Tyler Baze sent 18-1 Sassy Little Lila to the lead exiting the chute through fractions of 23.33, 47.03, and 1:10.57 over the firm going while pressed by 10-1 Ancient Secret and stalked by Madame Stripes. Entering the streth, Sassy Little Lila tired as Cambodia, 5th early under Drayden Van Dyke, circled the field 3 wide and opened up by 2 lengths at the 1/8 pole through 1 mile in 1:34.39. Kept to task by Van Dyke, Cambodia drew off late to win by 2 1/2 lengths over Madame Stripes in 1:40.51. It was a head back to 14-1 Sophie P third. Left: Cambodia in the winner's circle. Winning owner-breeder Don Robinson said, "We really wanted her to do this. I've never had a horse like this and we decided to run her at six, because it's such a thrill and I feel like I'm vindicated. She's run in two Grade Is this year and they don't give those away. She was close (despite finishing sixth and seventh) so we thought maybe she'd make it out here. This is her spot and she loves it." Right: Cambodia in the paddock. Winning jockey Drayden Van Dyke said, "She put me up there in the race. She's got that natural speed and she wants to be in the race. I was just biding my time; I had a couple to beat, but I had good aim. She likes this turf course, no doubt. It's all clicking for me right now. I'm feeling good and riding good. I want to keep it going." 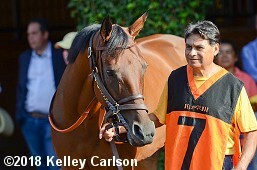 Left: Second place finisher Madame Stripes in the paddock before the race. 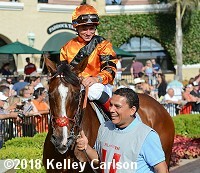 Jockey Geovanni Franco said, "It was a good trip for me. She came running. But the winner was just too good." Right: Third place finisher Sophie P in the post parade. Jockey Kent Desormeaux said, "She gave me a great run. If she keeps doing it like this, she'll win some of these things." 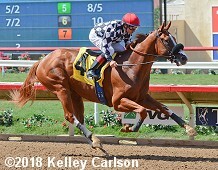 The co-feature on Saturday was the $100,000 Graduation Stakes for California bred/sired 2-year-olds sprinting 5 1/2 furlongs on the main track. Los Alamitos debut winner Our Silver Oak was the 8-5 favorite over 11-4 Oliver, a maiden winner at 3rd asking, and 3-1 Tap the Wire, a debut winner at Santa Anita. 7-2 Luck's Royal Flush dueled for the lead with Tap the Wire through fractions of 22.01 and 45.68 while stalked by Oliver. Entering the lane, jockey Drayden Van Dyke sent Tap the Wire to the front through 5f in 58.52. Kept to task by Van Dyke, Tap the Wire drew off to win by 3 1/2 lengths over Luck's Royal Flush in 1:05.48. It was another 3/4 length back to Oliver third, while favorite Our Silver Oak checked in last beaten 10 lengths. Tap the Wire in the winner's circle. 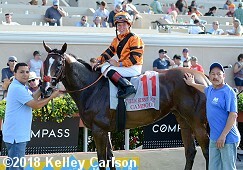 Winning trainer Daniel Dunham said, "It's special to win at Del Mar and to win a stake is even more special. I've won races here, but never a stake. I've won a stake before, but that was 15 years ago at Pomona. 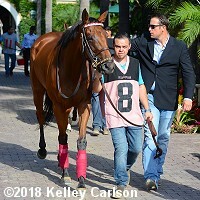 The (debut win by Tap the Wire) was one of the first baby races of the year, so we were able to give him a little time and have pointed to this race all along. This horse is a San Luis Rey fire survivor. He was turned loose and I found him the next day in a field of a different ranch. No major burns or anything; he was lucky. He came to Del Mar and trained here, so he knows the place. " Winnng jockey Drayden Van Dyke said, "He broke really well. We were just sitting in there; he was relaxed. I asked him in the stretch and he went. When we went by Gary Stevens (on leader Luck's Royal Flush), he (Tap the Wire) eased up. I was watching the big screen (in the infield) to see if anything was coming, but we were OK. I had a lot left. If anything came to him, I think my horse would have surged again."